The National Immigration Law Center (NILC) offers detailed information about your rights and links to low-cost and free legal assistance. This American Federation of Teachers (AFT) Guide for Educators includes advice on how to support and protect immigrant youth and families in case of a raid. 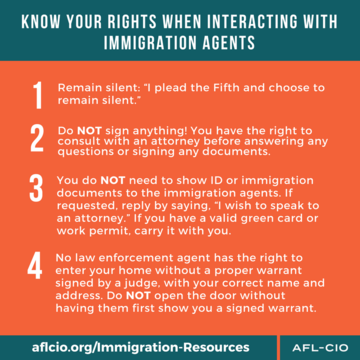 This guidance from the Immigration Legal Resource Center (ILRC) explains steps immigrant families should take before and during a raid. Asian American Justice Center is the only national legal advocacy organization that works to protect and advance the civil rights of Asian Pacific Americans. Asian Pacific American Labor Alliance is the first and only national organization of Asian American and Pacific Islander workers, most of who are union members, and allies advancing worker, immigrant and civil rights. Centro de los Derechos del Migrante, Inc. uses education, outreach and leadership development; intake, evaluation and referral services; litigation support and direct representation; and policy advocacy to defend and protect the rights of workers as they move between their home communities in Mexico and their workplaces in the United States. Farmworker Justice empowers migrant and seasonal farmworkers to improve their living and working conditions. The International Labor Recruitment Working Group seeks to end the systemic abuse of international workers who are recruited to the U.S., by collaborating across labor sectors to develop comprehensive policies and advocate for reforms. Labor Council for Latin American Advancement is a national organization representing the interests of approximately 2 million Latino/a trade unionist throughout the United States and Puerto Rico. Mijente is a hub for social justice organizing that is pro-Latinx, but pro-Black, pro-woman, pro-queer, and pro-poor. National Council of La Raza is the nation's largest constituency-based Hispanic organization that works to reduce poverty and discrimination, and improve life opportunities for all Hispanic Americans. National Day Laborers Organizing Network improves the lives of day laborers in the United States and helps member organizations develop leadership, mobilize and organize day laborers in order to protect and expand their civil, labor and human rights. National Employment Law Project is a national advocacy organization for employment rights of lower-wage and immigrant workers. National Immigration Law Center engages in policy analysis, litigation, education and advocacy for racial, economic and social justice for low-income immigrants. The National Immigration Project of the National Lawyers’ Guild provides legal and technical support to immigrant communities, legal practitioners and all advocates seeking to advance the rights of non-citizens.